Regular readers might have noticed how I keep including local American vegetables, spices, cheese in our everyday Indian cooking.... any ingredient which is readily available. You might have read my previous posts about Ricotta Cheese Mithai. Mexican Corn Tortilla Chips is also one of the ingredients I love. This time its a variation of Mumbai Street Food - Shev Puri, Dahi Puri a.k.a Dahi Papdi Chat. If you love desi chaat, you must give it a try. These crunchy tortilla chips add a nice corn twist to popular Indian street food. Soak yellow peas in water for about 2 hours. Cook the soaked peas in about 3 cups water until soft. Add salt, turmeric and asafoetida and bring it to a boil. You can skip this or instead of peas, you can use mung bean sprouts or moth bean (matki or motu) sprouts as well. Finely chop onions. Peel the potato skin and dice it into small pieces. Discard the tomato seeds and finely chop it. Finely chop coriander leaves. You can add finely chopped raw mango, pomegranate arils as well. Arrange the tortilla scoops on a big plate. Choose your choice of toppings. Add in cooked peas, followed by onions, potatoes and tomatoes. Add about 1/2 tsp of both Teekhi Chutney and Meethi Chutney, followed by 1/2 tsp of yogurt. Sprinkle the stuffed tortilla scoops with chat masala. Finally top with Sev and cilantro. 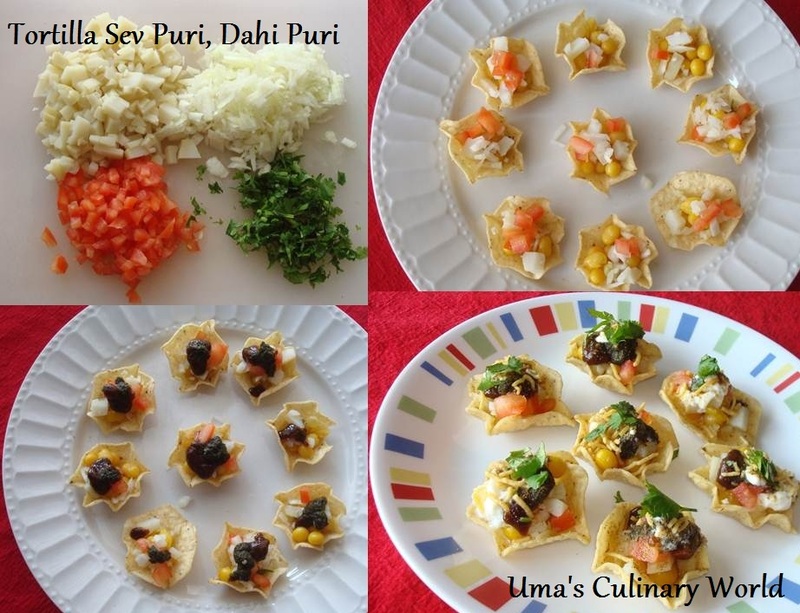 Enjoy crunchy, spicy Sev Poori and Dahi Poori anytime you like, perfect as appetizers too. vow what a cool idea ..Indo-Mex dish..
its very refreshing I have tried this at home!